‘Does collaboration mean compromise or a new creative direction?’ This was the question that occurred to textile artist Alison Holt when she was first approached by fashion designer Steven Tai. The opportunity to work on the signature piece for the innovative designer’s latest collection marked a new departure, but one Alison instinctively seized upon. In December 2012 Steven Tai, a fashion designer and graduate of Central Saint Martins, contacted Alison expressing his interest in working together. Steven was working on his AW13 collection, looking at the themes of ‘technology and juxtaposition with something delicate and soft’ and in his words he, ‘wanted to do something completely unexpected. ’He found Alison’s embroidery ‘… interesting and beautiful’ and ideally suited to the aesthetic he was looking to achieve. 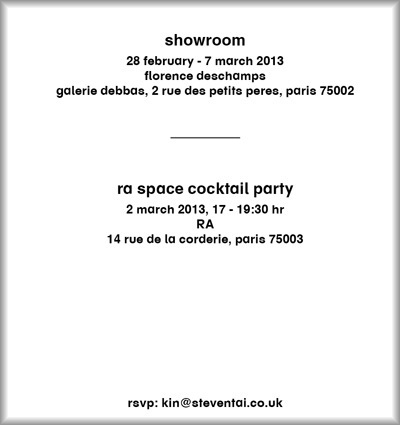 Steven had previously worked for Damir Doma, Viktor and Rolf and Stella McCartney and in January 2012 was selected as one of the 10 finalists for the Hyères International Fashion and Photography Festival by the head of panel Yohji Yamamoto. He went on to be awarded the first ever Chloé design prize and present his SS13 collection at Berlin Fashion week in July 2012. Alison was very interested to work with someone as talented as Steven and saw the opportunity to connect with the fashion world as an exciting new challenge. The logistics were interesting to say the least with Steven in London and Alison 200 miles away in Oswestry, Shropshire. Using emails and Special Delivery Mail and the occasional phone call they exchanged ideas and the collaborative process began. The unusual concept was based on an image designed by Franco Brambilla, an Italian illustrator devoted to sci-fi. From his series ‘Lets Go Back to the Classics’ he remade the first ‘Invading the Vintage’ postcard for Tai to use in his collection. This was the image to be interpreted by Alison in stitch. Tai and Holt discussed suitable fabrics, types, colours and weights of threads. The piece not only needed to be visually show stopping, but also to move beautifully when on the catwalk. Steven enthused about textures and techniques as Alison produced stitch samples based on various sections of the image. Alison used 3 different weights of thread, the 50 weight cotton being very familiar as its what she normally works in, but also a heavier weight cotton thread and wool, the idea being to add perspective and create texture and variation in the foreground. Working with these heavier threads was a little different as it meant the piece had to stitched from the back, then reversed to add finer detail in the lighter weight thread. 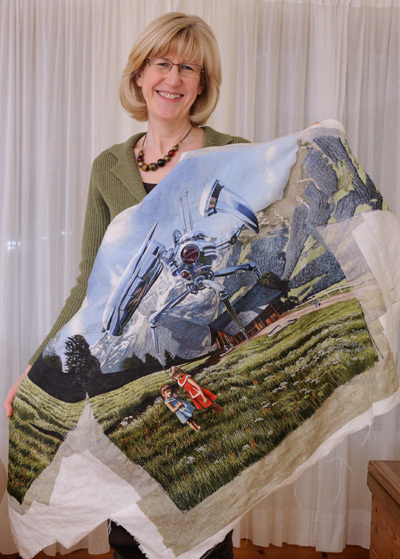 Interpreting in fabric and stitch the textures found in a wild flower meadow in the foreground or backdrop of snow-covered mountains wasn’t a difficult departure for Alison, but the distinctly alien robot with its shiny metal body certainly held its challenges. 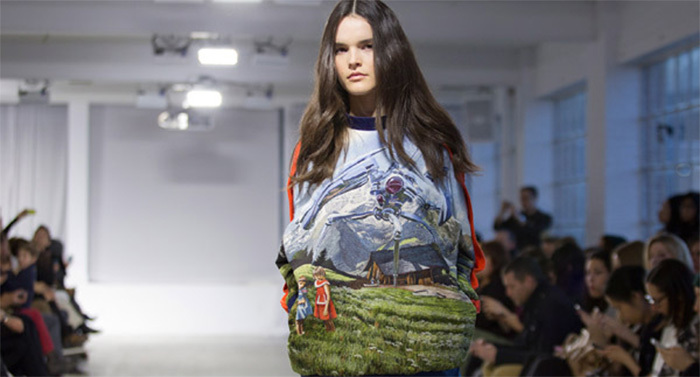 The end result and centrepiece of Tai’s collection was the ‘Silicone Valley’ jumper, or as those close to the project fondly referred to it; ‘War of the Worlds’ meets ‘The Sound of Music’. It was finally completed and Alison delivered it to London to Stevens’ studio when they met for the first time. He was thrilled with the embroidery, and remarked how 3-dimensional it looked. It held all the depth, perspective and realism usually associated with Alison’s work, while the subject matter provided an intriguing narrative. Inspired by the first piece Alison and Steven began work on a second more abstract garment. After discussion they decided to base it on a print of the original embroidery with only the two girls embellished in stitch, set against a backdrop of orange and turquoise silicone mountains. A few days later the finished collection was being scrutinized in a Paris showroom where buyers and press were left in awe. Steven said he wished he ‘…could have captured the moment people realised what they looking at; an embroidery.’ Its next outing was a catwalk show in Toronto in March 2013 where the collection was met by critical acclaim followed by the Hyères Festival in the south of France in April. Through this fascinating collaboration Alison was able to push her own boundaries and co-create something truly original, a piece of wearable art. Interestingly, working with Tai has really ‘broken down some barriers of scale’ and encouraged her natural progression towards producing larger pieces.